For a long time I had wanted to build my "dreamboat" from scratch. Along with a growing experience of offshore sailing, the dreamboat went from a solid steady mono-hull to catamaran to trimaran and from comfortable cruiser to a cruiser/racer. At our annual Boat Show a strange ugly bird caught my eye. Parked along the jetty she was a half built and unpainted trimaran with one folding float (the other wasn't ready yet). It was a trimaran design that was started as a home-build project. The reason for showing it was to check the interest and the possibilities of a production version. Looking though screwed up eyes I saw the possibilities of this boat. 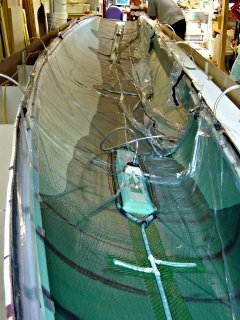 With 35 ft. in length and suitable accommodation this design was worth further investigation. One year later my wife and I sailed the prototype and it was gorgeous. A beautiful day with 20 knots of wind on a fast 35' trimaran was a total new sailing experience for us. Although not trimmed very well, the trimaran sailed at 11 knots upwind and 17 knots on a reach, incredible figures for us "leadswingers". Nevertheless there were a lot of things that had to be improved. I thought off buying bare hulls to finish them myself, but my confidence in the concept was not enough for a good feeling. I got the strong impression I was supporting an experiment and that didn't seem right to me. This was however the first important step in choosing the boat that was to become "the dreamboat". After a lifetime in mono-hulls, the choice of a trimaran was made. Her very fast sailing capabilities as well as the shallow draught were promise of a new way of sailing. I knew of the folding F-boat trimaran, but I thought they were too small for my needs. 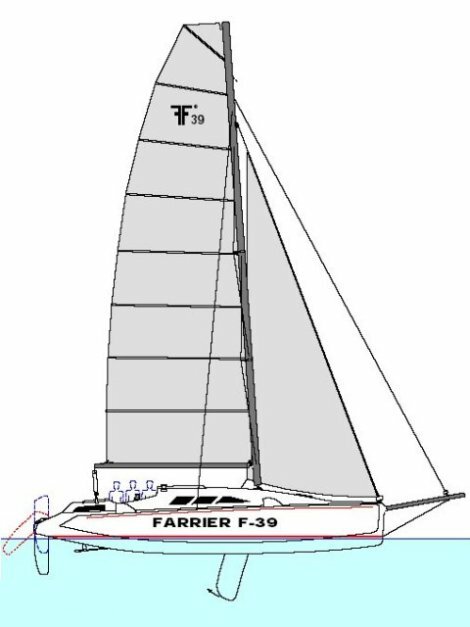 In those days I made my first steps on the Internet and discovered that there was also a bigger version of the Farrier trimaran available, the F-36. Now that boat had all the ingredients I was looking for. Not experimental, but a decent design with the highest references and everything on the right place. 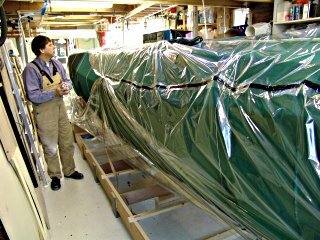 And, no less important, the Farrier design comes with a very comprehensive package of building plans and instructions for composite boat building. That was still a serious problem, being a wood person with a lot of bad judgements against "plastic boats". I needed some kind of re-programming of notions and I collected everything I could find about polyester, epoxy, fibreglass, building methods and so on to get more comfortable with these materials. I ordered Farrier's study book and the more I studied the plans, the more I realised that this boat is an engineering marvel and accompanied by a building method that I could manage. So it had all the necessary attributes for a high quality yacht! These superbly detailed building plans and the kind way with which Mr. Ian Farrier answered my questions were the determining factors for this final choice. The first one was the announcement by Mr. Farrier that he planned to upgrade the F-36 design to the F-39 design. Along with a lot of other improvements, my biggest wish was fulfilled by the folding option (the F-36 was only take apart for transport). Secondly was the discovery that my unpractised building skills with composite materials could be improved by Resin Infusion, a kind of black magic building method. Instead of a questionable "try-and-error" period, not very useful for a one-off project, I bought the technology with which I am able to do all the infusion work. The technique is computer simulated and because of this is called Controlled Vacuum Infusion. From the first hull it has been a great success and nowadays I'm infusing even single small parts as well as complete hulls. So, my wood period is definitely over and bit by bit I am developing more feeling for composite materials, their quality and structural aspects. 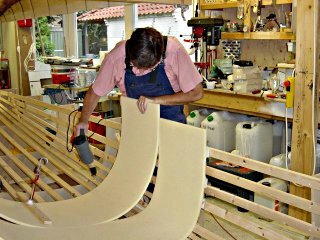 Working with foam is pleasant and much easier than with plywood, it is lighter, softer and very pliable. It is the core material in the sandwich construction, but at the same time the basic material from which the hulls are getting their shape. The foam also is the permanent mould for all reinforcements, which are being laminated by resin infusion, a clean process without the mess of sticky resins and harmful fumes. I am a happy builder again. Progress has been rather slow, mainly because it is a part-time building project. Using this technique in an amateur boat building project is still rare and because of this got lots of attention, which requires also a lot of my time. Internet and e-mail are the basis of this project and because of that I spent a lot of time behind the computer. I've gotten so many questions about vacuum infusion, that I decided to make a do-it-yourself starters kit for other builders who want to do resin infusion too. With this package one can start with a test panel and moving on to other parts, cut out beginners failures, just learn the right injection method from the beginning! On www.fram.nl you can find much more information about this ongoing building project. 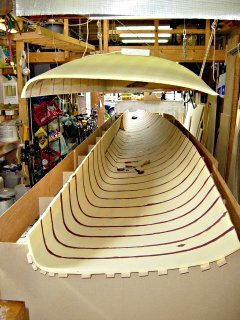 Editors note: I think that what Henny is doing is an example to all of us as amateur boat builders. He has interpreted the word "amateur" in its most noble form - and is pushing the enveloppe of amateurism to new limits! I am a big Farrier trimaran fan (the link was one of the first I put in the links page) and am following the F22 development phase closely. If you want to learn more about these construction techniques, which can also be applied to other styles of boats, grab a copy of the Farrier study book. It has long been on the shelf beside my bed and is worth every cent.